the commercial and domestic market. Packing away your kitchen items requires careful planning as there will be a lot of delicate and fragile items. Whilst some rooms in your house doesn’t require much of a strategic approach at all and can simply be bulk-loaded into boxes, the kitchen is different. All of your plates, glasses and crockery need to be carefully wrapped before the move. If these are particularly expensive or sentimental then it is a good idea to label the boxes so that anyone handling them know to be extra careful. Just simply writing fragile on the box would give you that extra bit of caution when you are loading or unloading it. Also, you should try to avoid using cardboard boxes, as although these are great for most packaging, they aren’t as sturdy and protective as plastic boxes. When you are moving house you will find you have cupboards or pantries of unused food and food items. It is a good idea to have a clear out of food that you haven’t used in months. It is not uncommon for movers to have two or three boxes full of tinned food that has been in the cupboards for months. If this is the case, save the time and costs it is going to take to transport them and just replenish your new house with fresh stock once you are settled. If you’d like any more advice about how to move house quickly or efficiently, get in touch with Removal today on 01924 371164. While it may be tempting to pack items up as quickly as possible, take a little time to group your similar belongings together as it will save time in the long run. It’s also worth asking if you really need the items or not – moving house is as good a time as any to declutter. Ensure that any things you will need in the first 24 hours (like toiletries or a change of clothes) are packed separately, so they are easily accessible when you need them. This may seem incredibly obvious but when we are in a rush this vital bit of packing is often forgotten. Being as specific as possible about the contents and what room they are for can really help when it comes to removal day itself, as well as unpacking later. Clear room labels will ensure boxes end up in the right area of the house, with more detailed descriptions of contents allowing you to prioritise which boxes get unpacked first. While it’s crucial you get your packing right, it’s also advisable that you change all the door locks when you move to a new house. There is no way of knowing who may have been given spare keys by the previous owners and whether they have returned them or not, so it is best to get new locks fitted straight away. AR Removals provide commercial and domestic removal services across Wakefield and the Yorkshire region. Our fully trained staff help homeowners move their belongings from A to B safely and efficiently. We also offer a packing and unpacking service if required. For more information about the services, we provide, please check out our domestic removal services. Or call us now on 01924 371164. When should I move house? Summer is the most popular time of year to move house, with 29% of all house moves happening in this time. Although it is the most popular, it may not be the most ideal or the most functional time for you and your family. So here at AR Removals, we have provided you with the benefits of moving for each time of the year. In Spring, everything starts to get a bit lighter, we see a bit more sun and the temperature starts to increase before the summer months. Spring also has a range of bank holidays; the long weekends give you more time to unpack and sort things out in your new home. Summer is the favourite season to move house due to many reasons, and it’s clear to see why. Not only is it the brightest and warmest time of the year, but the large summer holidays give the kids a longer time to settle in. Due to it being the most popular time to move, you will want to book a removal service well in advance. During autumn, you are still getting the back end of the light weather, as well as a cooler temperature, something that entices people to move at this particular time. The weather isn’t the only thing that tempts people to move in autumn, as it is just after the busy summer months, the rates of removal services go down. The most unpopular time to move for residents in the UK. The cold weather means the conditions won’t always be ideal for a house move due to icy surfaces making it dangerous. December is the most popular winter month to move, as people want to get in and organised before Christmas at the end of the month. Christmas parties, New Years, sales and other festivities make it a very hectic few months, meaning people don’t have time to move in winter. If you’re looking for a removal company to help you with your house move in the coming months, give us a call on 01924 371164 and one of our friendly team will be happy to help. Moving home can set families back a lot of money, and that isn’t including the price of the new home, hiring a removals team or the conveyancing. There are a lot of small things that you don’t think about when moving, which end up costing a lot of money. So, to save you from losing out on a big lump of cash, we have come up with a list of tips to help. Reducing the number of things to move can save you money in a lot of ways, not only does it cut down the number of boxes you need for packing, but it also reduces the amount of time that the removals need to work. Basically, the less items you have, the less money you will have to pay. When you are getting ready to move, you will be amazed at how many cans and packets of food you will have stored away at the back of cupboards, drawers, the fridge and freezer. If you don’t eat up your frozen and chilled foods, you will have to throw them away to prevent them from going off and invest in more food. Also, the less food you have means less things you need to pack, so eating up your food will mean fewer boxes, less waste and a surprising amount of money saved. 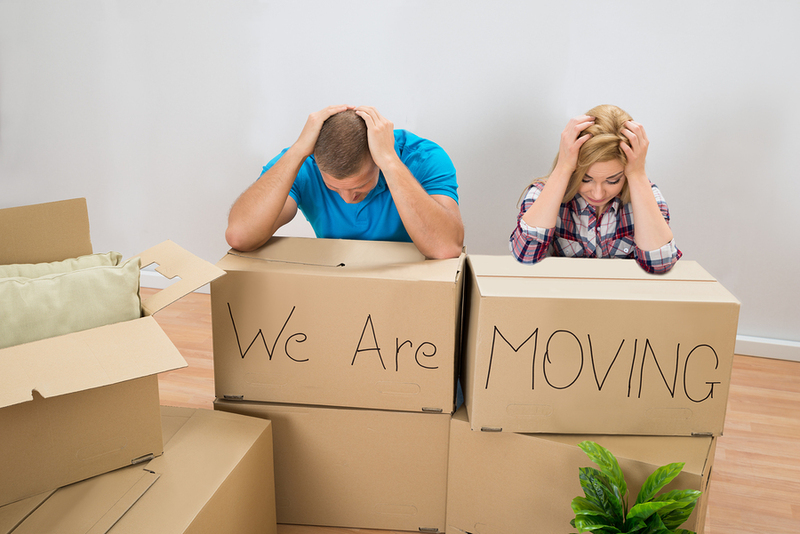 While you’re moving, be careful when leaving your current premises and entering your new one. You will be moving large objects, so be aware of your surroundings as you don’t want to break anything, mark any walls or damage any other kind of furnishings. An angry call from a buyer is one of the last things you want when settling in to your new home – the stress and cost of the process is bad enough without any other troubles, so be careful. Moving day is always stressful, but it makes things a lot easier if you have your packing sorted with a bit of time to spare. Regular occurrences such as realising you don’t have enough boxes or not even starting to pack until a day or two before are catalysts to a disaster house move. Here at AR Removals, we have come up with some top tips to help you with your packing when you move house. Don’t leave everything until the day before. If you do, you won’t have time to think about vital things such as what you want to keep, what you want to throw away, and you won’t have time to carefully pack those fragile items. All you will have time for is throwing anything and everything in to a box and sealing it up. Get your boxes well in advance. Think about other useful items such as bin bags, bubble wrap etc. Be smart, think about which items you will need at the start of the move, and make those easily accessible. Taking time on your packing is a must, valuables need to be carefully wrapped, furniture may need to be dismantled and you need to think about whether you want certain items. If you need an experienced, Yorkshire based removal company to help with your house move, be sure to give us a call here at AR Removals on 01924 371164. Some buyers spend twenty minutes viewing a property that they will live in for many years, and usually, they live to regret it. Don’t make the same mistake as them, there are a lot of things to look out for when viewing a house, and luckily for you, we’ve made a list of the most important ones. A little trick that sellers sometimes do is place smaller furniture in the room to make the room look bigger. So when you view the house, ask yourself – will my existing furniture fit in this room? You also need to think about what will be happening in those rooms. You may be the ones to host Christmas every year, is the living room and dining room big enough to host a number of people. Or are the bedrooms big enough for the kids to play in? Which direction is the house facing? In the winter months, it doesn’t really matter which way your house is facing, but if your house faces north and south, during the brighter months, you will get a lot more natural light. As well as the bright lights, your plants in the garden will be a lot healthier, whereas if they were in the dark they would protest by dying. Are there schools for your future/current children to attend? Are you near any clubs or bars that could get rowdy on an evening? Is there a nearby shop to walk to for essentials? Or would you have to drive? Is public transport easily accessible? Are there noisy roads or train-tracks? When you get past the house viewing stage and are moving, be sure to give us a call here at AR Removals and we will be happy to help! The best time to move house will depend on your particular circumstances, and house moving numbers for most months are similar. Small regional differences can be found, but there are benefits for most months. Summer is the most popular time to move, and is the best time for several reasons. Spring attracts house buyers to view houses, and houses will inevitably look more appealing in the brighter weather with flourishing gardens. The natural result of the upturn in sales figures in spring is that moving dates peak in summer. Time off work to move house will be more pleasant in the summer months, and many families choose to move in summer. Summer holidays mean that children can spend time getting used to their new location, settling into a new school at the start of the school year. The good weather will certainly be more convenient for moving day, with longer days providing more time for house moving tasks. Summer movers, though, should plan ahead, as this is the busiest time of year for removal companies. August is the most popular month across the UK, but September has its advantages, as weather is still mild, and post summer removal charges may be more attractive. Despite the apparent advantages of reliable weather in summer, winter is surprisingly popular, with Yorkshire favouring December as the best month to move. Winter movers generally prefer to be in their new home before Christmas, though a winter move may mean juggling Christmas festivities for a convenient day. February is the least popular month to move, perhaps reflecting the reduction in house-hunting before Christmas, and few will want to brave the likely snow and wet weather to struggle into a new home. Regardless of the month you choose to move, most moves take place mid-week. If you are hoping to move at the weekend, organising moving services such as conveyancing may be difficult, and removal companies will almost certainly charge a premium at the weekends. Whatever time of year you move, early planning will give you better choice. For a quote for your chosen removal date call the removal team at AR Removals on 01924 371164, the professional removal company for Wakefield and surrounding districts. Why use a removal company? Moving home is stressful, and expensive, but choosing a good removal company to help with your move will considerably reduce the stress and could prove less expensive in the long run. You may plan to reduce expenditure by moving yourself, but moving heavy furniture is hard work, and can be dangerous for yourself, and your furniture! At AR Removals, we visit your home before preparing our quote, so that we are well prepared with knowledge about what your specific requirements are. This leads to a smoother process on removal day. Our removal experts are used to moving furniture, and we know how to manoeuvre your large, heavy furniture through doorways, and up stairs, without damage. Professional removal companies have the right materials to protect your furniture. Your television and pictures will travel better when professionally wrapped by experienced removal experts. You can even arrange for your removal company to pack all your possessions for you, and a good removal company will arrange insurance, to give you peace of mind during the move. Saving money on professional removal costs may well be false economy if you have to take time off from your usual work to carry out the move, and possibly to recover from strain or injury. Moving time is hectic, and you will have a lot to arrange and oversee on moving day. Physically moving your furniture is time consuming and will take your attention away from all the other important matters you will have to attend to. Arriving at a new home presents its own challenges. You can confidently let our experienced removal men position your furniture and belongings safely, without the stress of worrying about damaging the paintwork, or your belongings. With the help of a professional, efficient removal company, you can be comfortably installed on your sofa by evening, instead of still struggling to step over boxes and furniture that you haven’t managed to put into place yet. For a bespoke quote for your move in Wakefield or the surrounding areas, call the knowledgeable team at AR Removals on 01924 371164, and let us help reduce the stress of your house move. Moving house regularly – Was it all a lifestyle trend? Before 2007, buyers would buy and sell five properties on average in their lifetime. It has now dropped down to an average of three properties, with most buyers staying in their home for at least 20 years. Originally starting off in a ‘starter home’ until they move on to somewhere that is more ideal and then down-sizing in their later years. Due to this, your ‘home for life’ search needs to be absolutely perfect and it is essential that you get it spot on. With a lot of buyers pre-planning by writing a tick list of what they need at their new home, it gives them an advantage because they know exactly what they are looking for. Finding your forever home isn’t straight forward though, compromises are inevitable as you and your partner/housemate may not want the same thing, so it is extremely unlikely you will achieve the full tick list. The single most important decision when buying your property should also be the first decision, the location. There is no point falling in love with a house if it isn’t functional in any way. When the area is decided, you can then move on to budget and everything else. When re-locating, it is important to drive round the area you are re-locating to, so you can highlight things that may be a problem and things that may be essential to you such as schools, shops, churches etc. It saves both you and the vendor time and effort by doing your research. We have a huge interest in what goes on in the property industry and love to keep up with the latest trends, as we are the ones who help you move it all! If you’re moving house anytime soon, be sure to give us a call on 01924 371164 or 07466165089 and we are happy to help! Moving house is a stressful time, so it makes sense to give a little thought to organisation, to ensure your house move goes as smoothly as possible. Hiring a professional, dependable removal company, like AR Removals, will go a long way towards ensuring everything goes smoothly on the day, but there are a few other things you can do to reduce chances of worry and mishaps. Do a careful calculation of the costs involved, to make sure your budget will cover what is ahead. Chose a reputable conveyancing solicitor, preferably one that comes with a personal recommendation. Your conveyancers see to all the legal requirements for your move, so reduce the chances of an expensive slip-up by choosing an experienced firm. Allow time to complete all the preparations without a last-minute panic. Start to make arrangements early, and sort through your possessions to ensure you are not paying to move things you don’t want. Try to be flexible. There are several people involved in a house move, and you may have to compromise. Make a ‘Moving Check-list’ – good ones can be found online – and consult it frequently. Forgetting to cancel the milk or read the electricity meter may not be disastrous but these mishaps add to moving day stress. Make a documents box, to keep all your important documents to hand. A valuables box may be useful too. Familiarise yourself with shops and amenities around your new home, so you can get necessities quickly after you move. Make a ‘Moving Day Survival Kit’, and include food, drinks, toiletries, children’s requisites, medications, emergency phone numbers etc. Don’t overdo it – include time to rest, and plan some time off from your removal tasks. You will return to the work refreshed and with renewed enthusiasm. Hire a professional removal company. You want to be confident your possessions will be treated with the care you would wish for. Compare prices, but make sure you compare what is included. AR Removals provide a bespoke service for home moves in the Wakefield area, so you can be sure you only pay for what you need. If you’re looking for a removal company to help with your stress-free house move, be sure to give us a call on 01924 371164.